L-R: John Everard, Jang Jin-sung, Shirley Lee and Peter French. 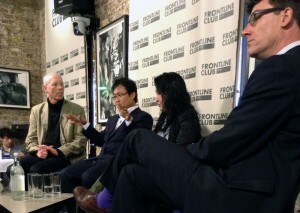 North Korea’s former poet laureate gave the Frontline Club a rare opportunity to hear about life inside one of the world’s most secretive and intriguing nations, in a discussion about the reality of its present and possibility of its future. Defector Jang Jin-sung was joined by Asia expert and commentator, Peter French, in a talk chaired by former British ambassador, John Everard on 8 May. Everard started the discussion by asking Jang if he thought North Korea has changed since he left, to which Jang replied through his translator, Shirley Lee, who is also an academic and editor of New International Focus, that the biggest change was the death of Kim Jong-il and the succession of his son, Kim Jong-un. Now living in South Korea, Jang founded the defector’s magazine New International Focus, but before he left, he lived a life of privilege and was the older Kim’s favourite poet.